Our 50 seater Scandinavian inspired Café space is a great local eatery with All Day Breakfast, Brunch and Lunch. Plus Great Coffee and Tasty Cakes. Our holistic classes are suitable for all levels. Choose between daily Yoga & Pilates Classes. Or try our specialist Aquatic Fitness Classes, Retreats, and Yoga Brunches. We love hosting Children’s Birthday parties and other family events in our Café space or studio. Contact us to discuss your catering requirements. At Swimming Nature we believe that swimming is a natural human ability that anyone can master. Our technique, teaching method and underlying philosophy are unlike anything you’ll find at any other provider. For over 25 years, we have recruited and trained the most talented professional swimming specialists. Today, they deliver personally tailored in-water instruction to thousands of children and adults across the country. "Lovely atmosphere and very helpful staff. Delicious cakes and coffee"
Isam Bachiri Live - formerly from the band Outlandish performs music from his illustrious career spanning over 20 years! After 20 years in the band Outlandish and 11 years since his solo debut, Isam Bachiri releases his new album ‘Lost For Words’. 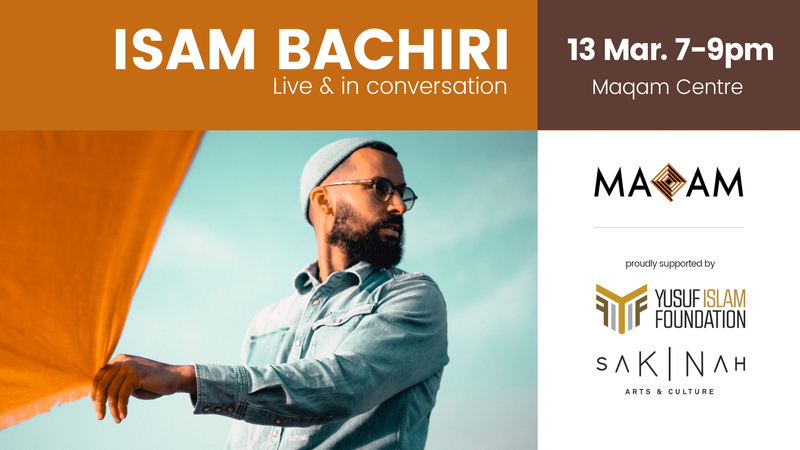 We are super excited to be hosting Isam at The Maqam for an intimate night of song and conversation. This is an exclusive concert that allows 40 fans to get up close to the man and his music.